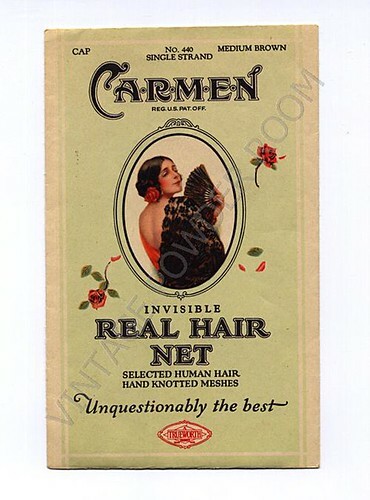 Could the woman on the hairnet envelope be anyone other than Carmen, the fiery temptress and faithless lover in Georges Bizet’s opera? In the first act Carmen, a cigarette factory worker, seduces a young solider by tossing a flower at his feet. Really? Clearly it didn’t take too much to capture Don Jose’s attention, or his love. 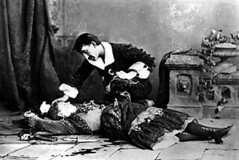 By the end of the last act Carmen had dragged Don Jose’s reputation, and his heart, through the mud. Of course a woman of Carmen’s volatile temperament could not hitch her wagon to a doormat, so she would jilt Don Jose in favor of Escamillo, a handsome toreador. In classic operatic tradition Don Jose doesn’t thank Carmen for the memories and bid her adieu – he picks up a knife and stabs her to death just as Escamillo wins the bullfight. Opera has never been known for its subtle symbolism. And that is precisely why I enjoy opera so much. It never makes a small gesture. 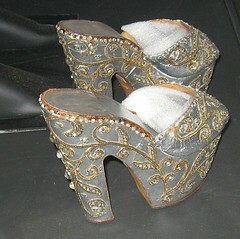 There is something else that has never made a small gesture – platform shoes. They are incapable of restraint. 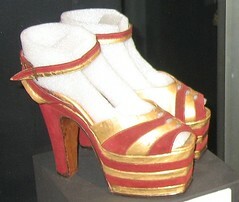 Apart from rock stars of the 1970s, my favorite wearer of platform shoes would have to be Carmen Miranda. It’s easy to think of her as an opera on two legs. And she did not earn the moniker “Brazilian Bombshell” by being a wallflower. She was bold and brash and so was her footwear. Carmen was born in Varzea da Ovelha, a village in the northern Portuguese municipality of Marco de Canaveses. She was christened Carmen by her father because of his love for Bizet’s masterpiece. His passion for opera influenced all of his children, and especially contributed to Miranda’s love for singing and dancing at an early age. Her father may have been a fan of opera, but he did not approve of her plans to enter show business. However, in true operatic fashion her mother supported her and was beaten when her husband discovered Carmen had auditioned for a radio show. Carmen had previously sung at parties and festivals in Rio. Her older sister Olinda contracted tuberculosis and was sent to Portugal for treatment. Miranda went to work in a tie shop at age 14 to help pay her sister’s medical bills. She next worked in a boutique, where she learned to make hats and opened her own hat business which became profitable. She may never have envisioned just how well the hat making skills would pay off! Carmen was very popular in Brazil, but once in the U.S., Carmen’s career (and platforms) hit the ground running. She arrived in 1939 with her band, Bando da Lua. She was presented to Franklin D. Roosevelt at a White House banquet, and went on to star in a baker’s dozen of Hollywood films! Just eight years later Carmen was the highest-paid entertainer and top female taxpayer in the U.S., earning more than $200,000! On March 17, 1947 she married movie producer David Sebastian. He was not a successful producer and even more of a disaster when he declared himself Carmen’s manager. In the few months that they lived together as husband and wife he made a series of bad business decisions. He was a boozer, and dragged Carmen along with him. Carmen was a Catholic and would not seek a divorce so she and David were legally married until her death in 1955. The “lady in the tutti frutti hat” has had a profound influence on popular culture, and her likeness has popped up in everything from cartoons to the character of Chiquita Banana. On August 4, 1955 while appearing in a live segment of the Jimmy Durante Show, Carmen collapsed. She recovered quickly and resumed her performance not realizing that she’s suffered a heart attack. Her heavy smoking and alcohol consumption, compounded by her use of amphetamines and barbiturates had taken a serious toll on her health. 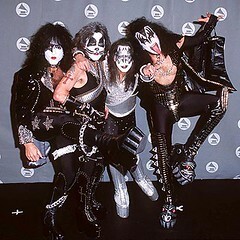 Later that night Carmen suffered a second heart attack at her home in Beverly Hills and passed away. Honoring her wishes, Carmen’s family had the entertainer’s body flown back to Rio de Janeiro. The Brazilian government declared a period of national mourning and 60,000 people attended a formal ceremony in Rio’s town hall. More than 500,000 people escorted the funeral cortege to her final resting place. I’ve never had a burning desire to visit Rio de Janeiro, but after finding out that there is a Carmen Miranda Museum there – I may have changed my mind.